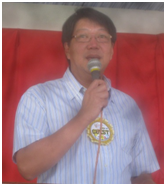 School President, Mr. Alfonso F. Gamboa, shed light on the spreading issue of the school’s cessation as an educational institution and total conversion to a BPO company in his speech during the 89th alumni homecoming activity last 15 February 2014. He assured all the alumni present that Silay Institute will remain as an educational institution and will continue to exist for 89 more years. The said statement of the President relieved the alumni from their alma mater and expressed their appreciations to Mr. Gamboa for personally delivering the good news. A warm and loud applause followed the speech as audience’s way of showing appreciation to the president. Also present during the program were Dr. Rosario J. de Guzman, the School Director, Mrs. Lilian Reventar, Director of BPO Asia Institute (BAI), a member of ADEC Group of Companies and the keynote speaker for the said homecoming, Mr. Arnel G. Esguerra Site Director of ADEC-Silay, Ms. Marife Ferrer, HR Manager and Ms. Ferdalene Dela Banda, HR Officer of ADEC-Silay. Togather, they proved how serious the partnership is in bringing the school to a higher level.